Anyway, let me tell you the story of how I pantsed a mannequin. Twice. Well, once I was more of an accomplice. But I'm getting ahead of myself. *I have plenty of running gear. But oh, how I love running gear! I tend to be pretty cheap, though, so rather than plunk down the money on a pricey pair I instead trolled clearance racks and online sales. I wanted reasonable quality, of course, but I also wanted a killer price. Alas, the weeks went buy and nothing quite tempted me enough to buy. 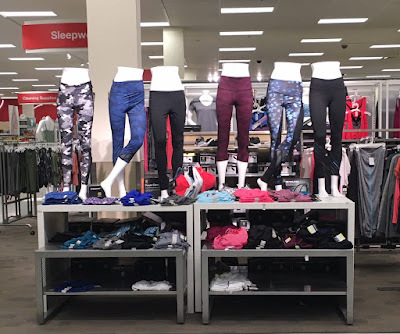 Then one day I was prowling around the Target activewear section and saw a pair of running tights... down around a mannequin's ankles. Intrigued by this apparent violation of mannequin rights, I investigated. I investigated the pants, mind you. (The mannequin was on her own.) The tights hit my boxes - black, with a pocket, high-waisted. Bonus: cute pattern on the legs. I peeked at the size: small. Could work! But the mannequin's feet were firmly attached to the podium. Additional wrinkle: those particular running tights were the only of their kind in the store. I checked all the piles and racks - nada. I checked the Target website, and while these particular tights WERE on sale (yay!). they were NOT available for online order (boo). So I slunk away, defeated. Finally I couldn't take it any longer. I resolved that if the tights were still on that damned mannequin on my next grocery run, I would find an employee and I would GET THEM OFF THOSE DISEMBODIED LEGS. Sure enough, next time I hit up Target, there they were! The waist of tights had been pulled down a bit off the half-torso, as if someone saw me coming and tried to rob me of my victory but couldn't get them off in time. After multiple inquiries I was able to track down a staff member who could help me, and that remarkable employee lifted the mannequin off its support post, slipped off the tights, and handed them over to me like it was no big deal. At the register, they rung up under $9. AND THE CROWD GOES WILD!!!! And that's the story of how I secured THE LAST RUNNING TIGHTS ON EARTH. Okay, that's not true. But man, was it satisfying all the same. What's your proudest running gear purchase moment? Just epic. Totally something I would do - when you gotta have them, you gotta have them!